Today we’re excited to announce one of these new offerings, called author follows. This feature, which has been requested by many of our members, lets readers tell us who their favorite authors are so we can keep them updated on what’s new with those authors on BookBub. 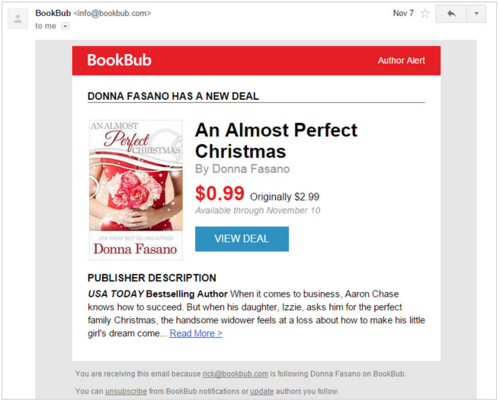 In the short term, readers who follow an author will get a special dedicated email whenever BookBub features a deal on a book by that author. As a result, members who use this feature will be less likely to miss promotions from their favorite authors, and if (heaven forbid) a member at some point decides they want to unsubscribe from the BookBub daily email, they can still get these special alerts when their favorite authors feature a deal. But this dedicated deal alert is just the beginning for author follows. In the future, we hope to expand upon this feature so that our partners can announce other news and promotions to fans that discover them through BookBub. Down the road, for example, you may be able to communicate with a group of BookBub readers who love your work, or follow up with members who downloaded your freebie to tell them about a new release. We’ve heard from many readers that they’d love to receive this type of update from their favorite authors. There’s nothing our publisher and author partners need to do at the moment, and we’ll continue to keep you all informed as we improve upon this new feature, but in the meantime, we’d love to hear your feedback!